Pumpkin Ale – The Barley Whine bourbon barrel aged Imperial Pumpkin Ale at 10.5% ABV, a West Coast interpretation, the Autumn Maple at 10% ABV, yam based brew with pumpkin spices, molasses, vanilla and Belgian yeast from The Bruery, and from Hoppin Frog, Frog’s Hollow Double Pumpkin Ale at 8.4% ABV. Also included was a favorite from New York, the Southern Tier Pumking, another imperial at 8.6% ABV. 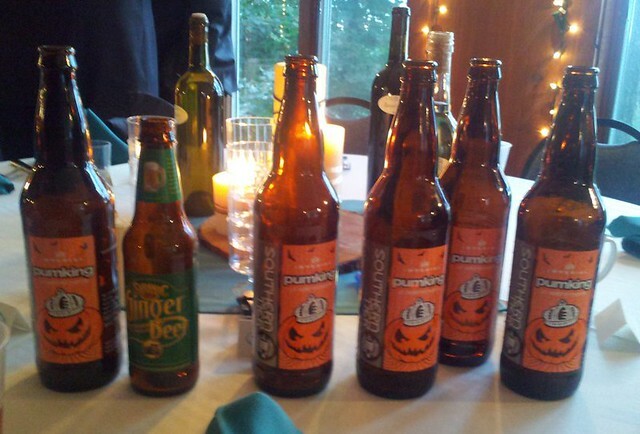 For the first round of pumpkin beer tasting we sampled seven beers blindly, no more than two at a time. So what is the best pumpkin ale? Southern Tier – Pumking: Splendid from first wiff to the sweet sorrow of the last sip. Pumpkin pie with whipped cream. Caramel corn with cinnamon and vanilla rainbows. This beer was in limited supply in 2010 but seems to be more available this year. Buy it now! Dogfish Head – Punkin’: A traditional favorite of The Barley Whine, this time our samples lacked a lot of the pumpkin and spice that we remember. A solid showing but a bit dull compared to what else is out there. Smuttynose – Pumpkin Ale: Smutty brings an assertive hop presence to everything they do, and this is no exception. For people who dislike the sweetness of fruit based beers but like pumpkin spices, this is a good alternative. Good pumpkin presence. Hoppin Frog – Frog’s Hollow Double Pumpkin Ale: A mix of pumpkin spices, molasses and ginger. Not much gourd flavor, and a bit flat in the finish, but not a bad brew. The ginger is a unique touch and reminds us of their winter offering. The Bruery – Autumn Maple: Dark in color, the strong maple flavors are up front on the palette. A lot of sweetness, with some of that funk that people love or hate in certain Belgian yeast strains. Super complex brew made from yams. Well worth trying if your glucose levels are in check. Steve loved it. Dave was ‘meh’. 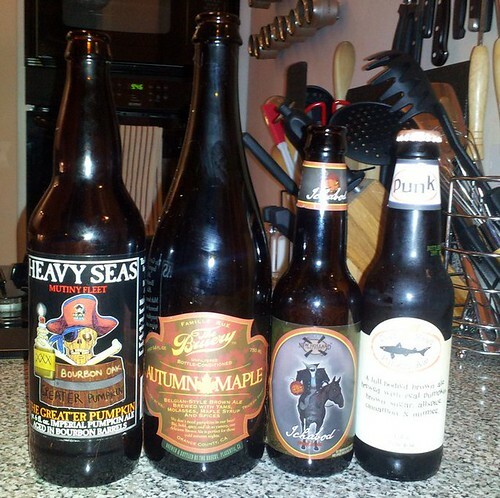 Heavy Seas – The Greater Pumpkin: Big cinnamon/nutmeg nose. Very sweet, which helps cover up some of the 10+% ABV. Lots of vanilla/oak flavors coming from the bourbon barrels this guy was aged in. One of our favorites. If you see this one, pick it up. New Holland – Ichabod Ale: Classic pumpkin pie smell (cloves, cinnamon, nutmeg) and solid malty sweetness. More spice than fruit but finishes cleanly and has great balance. This one was a real surprise and compromised what most people expect from a good pumpkin ale. Pumpkin beers are generally brown ales with pumpkin spices added along with some pumpkin, but a “typical” pumpkin beer is becoming harder to define. The style has a lot of diversity in the craft brewing world, and each of the beers we sampled were interesting and enjoyable on their own. As far as the best pumpkin beer however, so far nothing for us has topped Southern Tier’s Pumking. It tastes like pumpkin and so much more. The high alcohol is well covered in the creamy nutmeg, clove, cinnamon medley. The sweetness is subtle, not cloying. Among this tough competition, Southern Tier comes out on top.